With the new academic year in full swing, enrollment numbers are in, and Professor N. Gregory Mankiw’s Economics 10a: "Principles of Economics" has surpassed CS50 in undergraduate enrollment. This consistently popular course, however, comes with a caveat this fall. Mankiw has required all students to purchase a copy of his textbook from the Harvard Coop in order to access an online service for submitting problem sets and online quizzes—a stipulation that will cost each student who enrolls $130. Because the paid online service is the exclusive system for students to submit quizzes and assignments, buying or renting course materials that are anything but brand new is no longer a possibility. 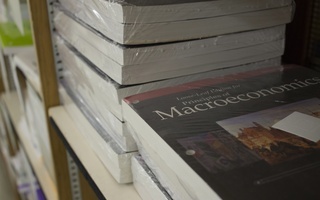 Without the online access codes, students are not able to complete course requirements, and the possibility of successfully finishing the course rests simply on the ability to purchase the textbook. This change to Ec10 represents part of a corporatization of education, where the sharing of knowledge has become another business opportunity, and maximizing profits come above the will to foster open intellectual discourse. Given the price of college tuition, academic publishing should not be making excessive profits on the backs of students who already suffer from crippling debt. The effects of these tendencies occasionally border on the absurd. Ec10’s decision to use a new online platform, for example, fabricates a nonexistent need in order to justify the purchase of unnecessarily expensive software. A multitude of different online programs are already provided for free by the University—Canvas, for instance—where students can submit online assignments. Thus, this shift in policy is antithetical to the fundamental ideals of a liberal arts education. As an institution, Harvard strives to maximize access to education and make barriers of entry as low as possible, providing each student with the intellectual freedom to explore their interests. By putting a minimum $130 sticker price on an introductory economics course, Ec10 prevents low-income students from accessing the Economics Department and stifles their interest in a potential concentration in economics. As evidenced by enrollment, most students can most likely scrape together the requisite sum, but it is still a large enough disincentive to send some students reeling. Worse, students’ decisions whether or not to enroll in Ec10 may affect students for the remainder of their adult lives. Economics classes are Harvard's most common entry point to business and finance worlds that already lack diversity. Bottlenecking access to an education in economics only exacerbates this issue, creating an ironic positive feedback loop: Only students who come from relatively prosperous financial backgrounds can comfortably access the education that will prepare them for the most lucrative post-graduate opportunities. But if making the Economics Department less accessible were not enough, the problem is furthered by the fact that Ec10 is a concentration requirement for other concentrations in the social sciences. This decision has far-reaching effects that go beyond the confines of one course, and in effect places a sticker price on those concentrations too. At an institutional level, Harvard has made many strides toward increasing accessibility of education. 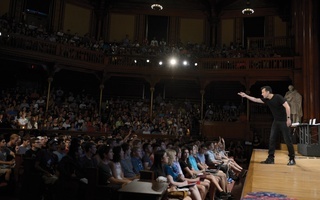 But as long as individual classes like Ec10 continue to erect such high financial barriers of entry, these strides will remain a far cry from the ideal of free intellectual exploration Harvard embraces. ​What the Hell Do You Have to Lose? Economics 10: "Principles of Economics" regained its status as the course with the highest enrollment this spring, beating out Statistics 104: "Introduction to Quantitative Methods for Economics."